Gordon Thompson, Jr. was a federal judge on the United States District Court for the Southern District of California. He served on the Federal bench from 1970 through 2015. He served as the district’s chief judge from 1984-1991 taking senior status in 1994 and served in that capacity until his death on July 5, 2015. 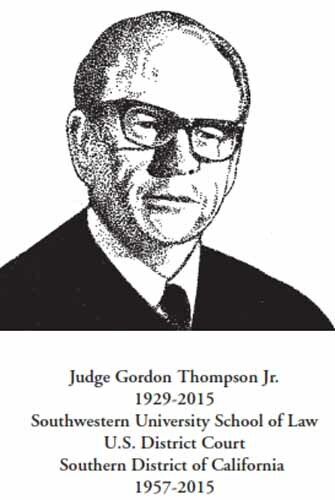 Judge Thompson received his under-graduate degree from the University of Southern California in 1951. He received his LL.B from Southwestern Law School in 1956. He served as a deputy district attorney for the county of San Diego from 1957 until 1960. A life-long resident of San Diego, he joined his brother in private practice, becoming one of the county’s most celebrated criminal defense attorneys until his appointment to the federal bench. His strength of character; his unwavering commitment to fundamental fairness; his unconditional resolution to treat everyone equally was legend among all he encountered during his lifetime.